This past year has been a year of extremes. We have seen unprecedented assaults on our civil liberties, at every level of government. Seemingly every morning we awake to a new norm shattered, another line crossed. And yet for every shock and step backward, we’ve seen an equal and opposite reaction in defense of our fundamental freedoms. From the millions of people who joined the ACLU for the first time to the thousands of people who rushed to airports across the nation (including Indianapolis) to protest President Trump’s Muslim Ban, this year has been a watershed for civic engagement in America. The ACLU of Indiana—the 70,000 Hoosiers who receive our action alerts, our 14,000 card-carrying members, our staff, and our volunteers—has been proud to participate in this resurgence of democratic spirit. 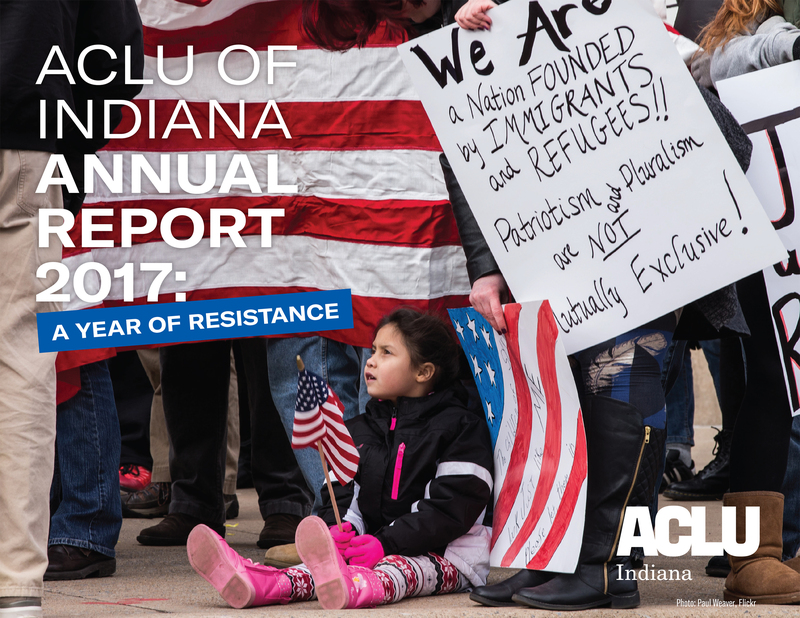 Below you will find a link to this year’s Annual Report which details how, together, we are #resistance in 2017: the lawsuits we’ve filed to protect your rights from unconstitutional government actions, and the people-powered protests and movements you’ve created to demand that our government live up to the promises of the Constitution. Everyone at the ACLU of Indiana—our lawyers, staff, and board of directors—is grateful for the incredible support we’ve received from across the state and across the nation. Every social media post you’ve shared, every dollar you’ve donated , and every call you’ve made to an elected official has made our work possible. Thank You. We promise the ACLU is and always will be right there in the fight with you.